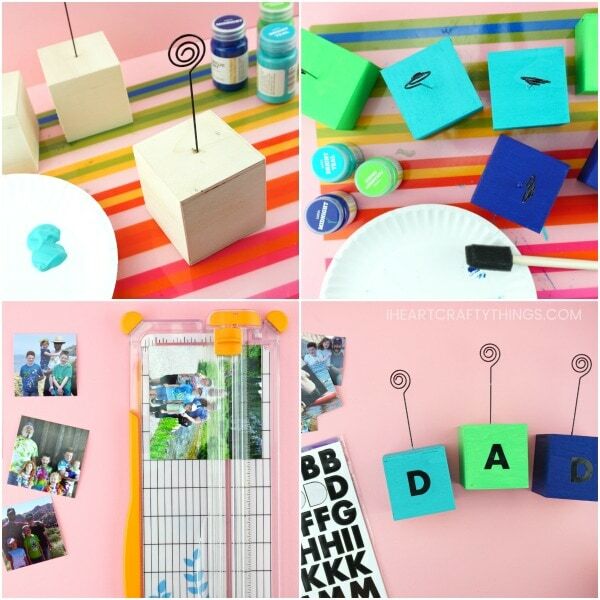 These simple DIY Photo Blocks make perfect gifts, especially for Father’s Day. 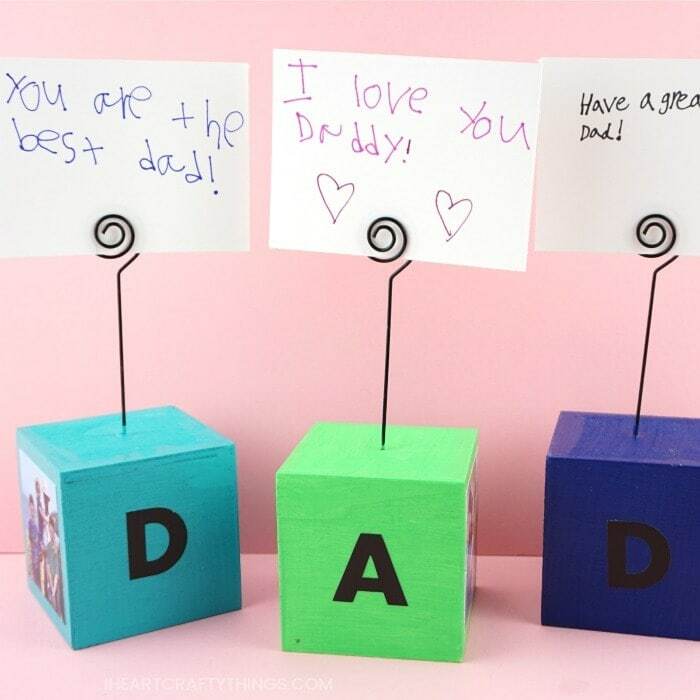 Dad or Grandpa can place them on their desk at home or work as a special reminder of how much they are loved. 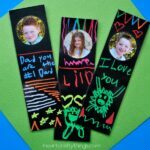 Best of all, kids can periodically change out the notecard on the photo block bringing new smiles to Dad or Grandpa throughout the year. 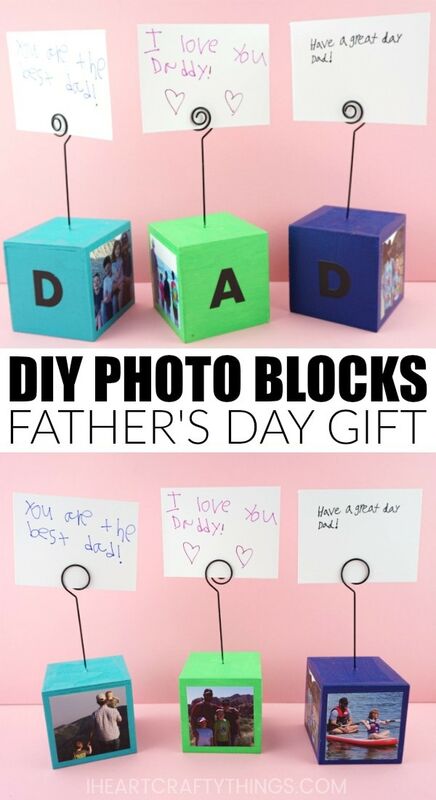 We’ve added the letters D-A-D on some of our blocks but you could also cover each side with a photo and give a single DIY photo block as a gift. This post contains affiliate links to the products mentioned. I Heart Crafty Things is a participant in the Amazon Services LLC Associates Program, an affiliate advertising program designed to provide a means for sites to earn advertising fees by advertising and linking to amazon.com. 1. Begin by painting the top and sides of your unfinished photo blocks. Set them aside to dry completely. 2. 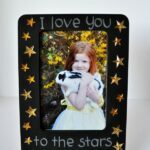 While your DIY photo blocks are drying, use a paper cutter to cut out your photos to around 2 1/2-inch x 2 1/2-inch. 3. Optional: Add the letters D-A-D to the front of three of your photo blocks. 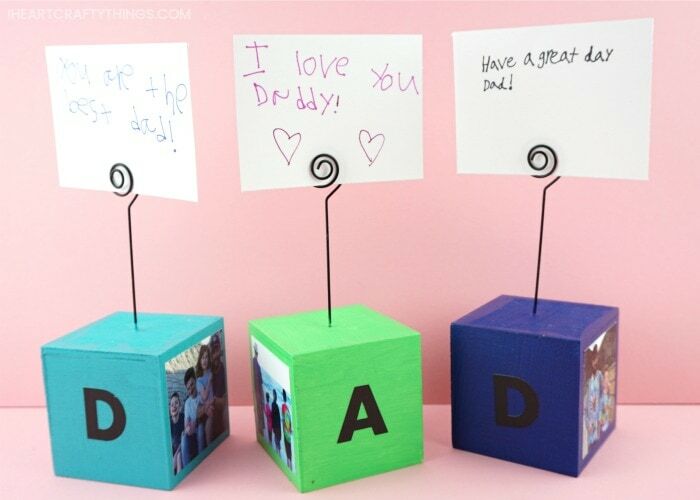 You can also add DAD on one block or omit the letters entirely. 4. Open your Modge Podge and apply a layer to one of the sides of your photo block. Place a picture in the center of the block. Continue adding Modge Podge on each side of the block and placing a photo in the center of each side. Set the DIY photo blocks aside to let the Modge Podge dry completely. 5. Once the Modge Podge is dry, apply another coat of it around all of the sides of the photo block, covering the letter stickers and the photos. Let the Modge Podge dry completely. 6. Cut out note cards from your white cardstock about 4-inch x 3-inch. Let your children write special notes to Dad or Grandpa on the notecards, or have them draw pictures on the notecards. 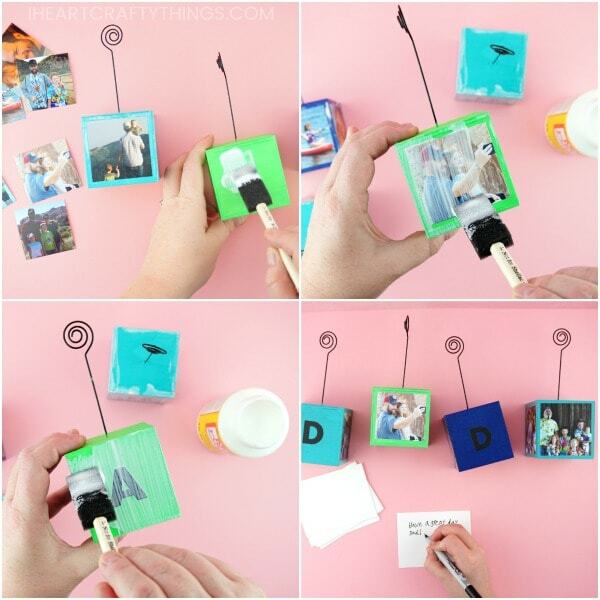 Your DIY Photo Blocks are complete! Place the notecards in the top of the photo block and Dad or Grandpa can place it on their desk and home or work and cherish it every day. 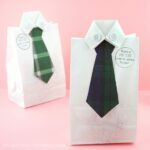 These Father’s Day Books made out of paper lunch bags are a special keepsake Dad and Grandpa will treasure forever. Have a super Dad? Turn a Hershey’s candy bar into a superhero that looks like your Dad and personalize the gift tag letting him know what makes him super. This peekaboo owl card is adorable and will let Dad or Grandpa know exactly whooooo loves them.